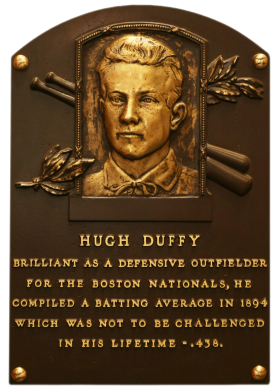 In 1894, the diminutive Duffy hit .438 for NL Boston, the highest mark ever recorded under current rules. He also captured the first ever Triple Crown that year, with 18 homers and 145 RBI. Never again approaching .400, Duffy still compiled a career .324 average, 1,551 runs, and 1,299 RBI. He led the NL in homers twice despite playing at 165 pounds. After his retirement, he served another 48 seasons as manger, coach, owner, and scout. Comments: The first Duffy I purchased was a tribute card, a 1972 CPC, in July 2000 via eBay. In September, 2002 I won another eBay auction for an issue contemporary to his career - a T205 PSA 2. Upon receipt, I didn't like the card as much as some of the other cards in the set where the player's face takes up the whole frame. 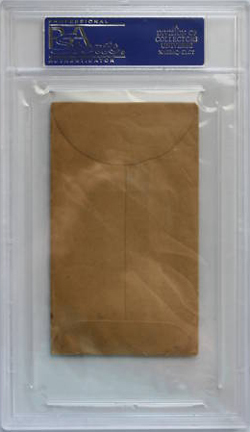 I purchased a PSA 8 Fan Craze card on eBay from Mike Wheat Cards in March, 2004. 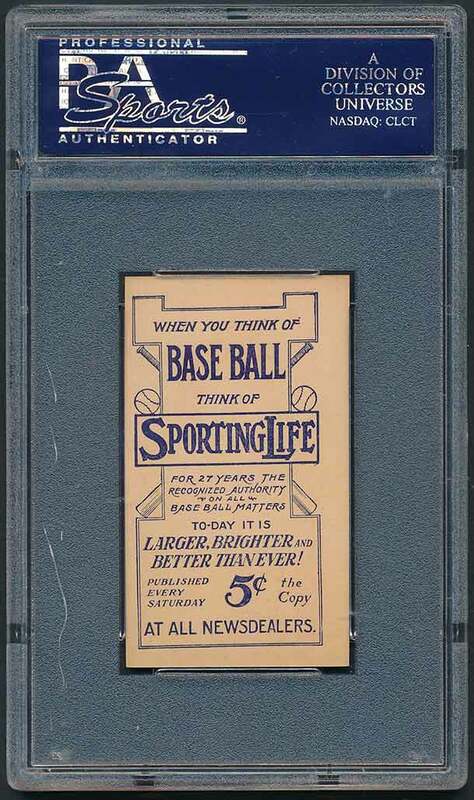 I went back to a tribute card, when I purchased a 1950 Callahan PSA 9 in April, 2003. I made another change in November, 2006 when I opted for a M116 SGC 20 card with another eBay win. I upgraded to this PSA 5 after winning a Goodwin & Co. auction in April, 2008. I have not seen a better example offered since. 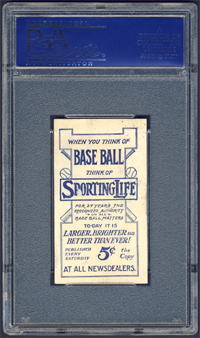 Description: This set of 1-1/2" X 2-3/4" cards was offered to subscribers to "Sporting Life", a major competitor of "The Sporting News" in the early part of the century. 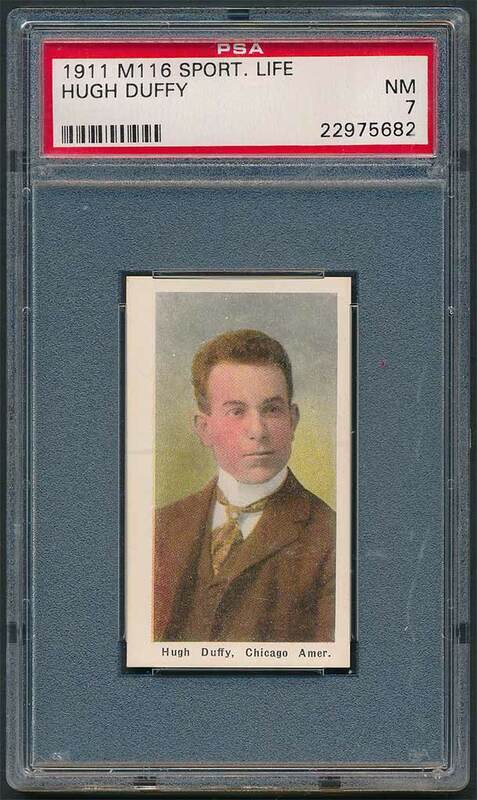 The cards were issued in 24 series of 12 cards each, sold by mail for four cents per series. 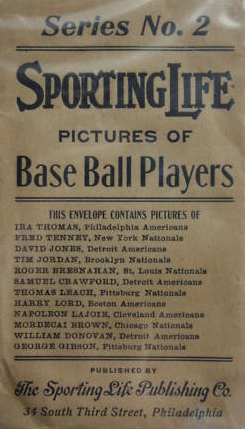 Card fronts feature hand-tinted black-and-white portrait photos with the name and team printed below. Backs have various ads for the weekly paper. The last 72 cards issued are scarcer than the earlier cards. The scarce blue-background cards appear to have been a second printing of the first two 12-card series which no doubt sold out quickly in the original pastel-background version due to the popularity of the players included. 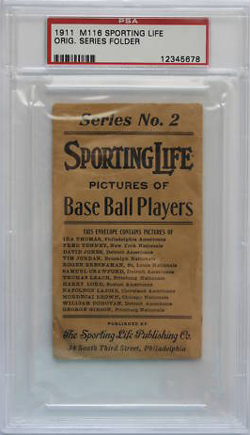 The 12 players in the Third Series can be found in an original printing with the ad on back printed in black, and a later reprinting with a blue ad. 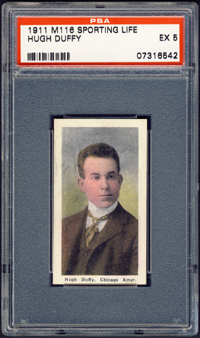 Each of the Third Series cards also exhibits on front subtle differences in the size and coloring of the player portrait.